Mission Hills has launched two enticing short-stay packages for golfers and families in its Haikou resort on the tropical island of Hainan in China. Mission Hills Haikou boasts ten world-class golf courses set amid rugged black lava rock – with its crown jewel Blackstone course considered among the best in Asia. Those attempting the Blackstone will be in good company, having been the course of choice for both the World Cup of Golf and the Mission Hills World Celebrity Pro-Am. The pro-am tournament was inaugurated in 2010 and boasted a playing field that included Hollywood celebrities Catherine Zeta-Jones, Hugh Grant, Matthew McConaughey and Christian Slater competing against Greg Norman, Nick Faldo, Colin Montgomerie, Annika Sorenstam, Lorena Ochoa, Yani Tsang. Away from the fairways, the 176,284 square-meter Mission Hills Volcanic Mineral Springs & Spa Resort offer guests an extensive range of holistic and wellness treatments in an architecturally striking facility. Other resort offerings include 518 elegantly designed guest rooms and suites, 12 world-class restaurants and bars, a fully-equipped sports and fitness centre, Hainan’s only aquatic theme park, kids’ recreation centre, a shopping arcade featuring the world-renowned sport and fashion brands and many other facilities. Mission Hills Haikou is a fully-integrated family resort and a perfect holiday destination offering something for everyone. Mission Hills Haikou is 15 minutes from Haikou Meilan International Airport with direct flights from major cities throughout Asia including Beijing, Guangzhou, Hong Kong, Shanghai and Singapore. 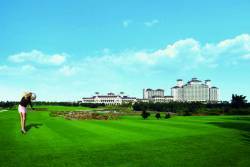 Mission Hills Haikou is regarded as China’s Leading Golf Resort by the World Travel Awards.